Wow, I can’t believe it’s been almost 3 weeks since I last posted. Life has been good, but insanely busy. I feel like I’ve been going non-stop at hyper speed ever since we got back from Hawaii. I am happy to say that everything is slowing down, and I’m also happy to be sharing this yummy Lasagna Cupcake recipe with you! M is at the stage where all she wants to do is help me cook. She wants to be involved in everything, from pouring cereal, to making a sandwich, to whisking eggs. 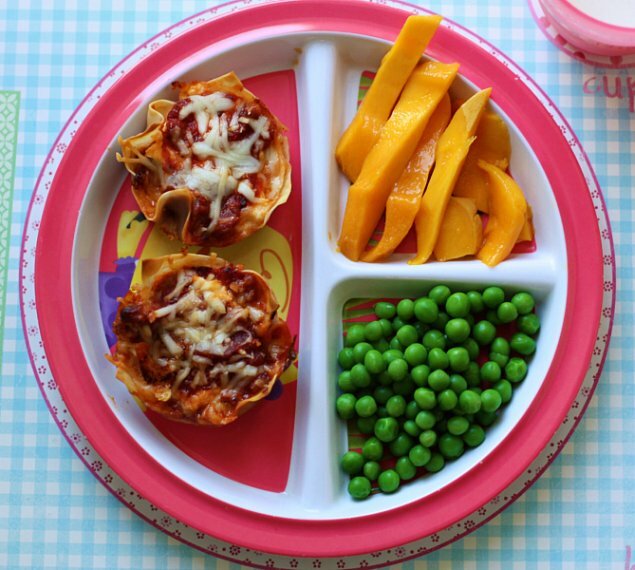 These little lasagna cupcakes were the perfect little kitchen project for her. Not only are they easy to make, but they come in a super cute cupcake size. 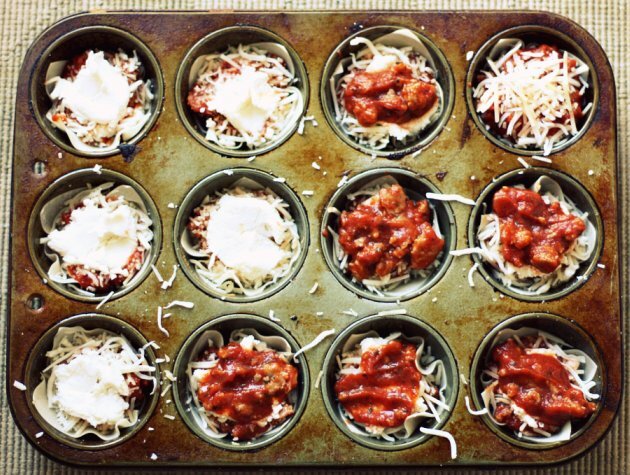 All we did was place wonton wrappers in a muffin tin, then layer with parmesan, mozzarella, ricotta, and marinara sauce. M did everything from placing the wonton wrappers, sprinkling the cheese, and spreading the sauce. Preheat oven to 375 degrees. Spray a muffin tin with non-stick cooking spray. Heat sauce pan to medium heat and cook turkey sausage until brown and cooked through. Add marinara sauce to the sausage and stir mix through. Set sauce aside. 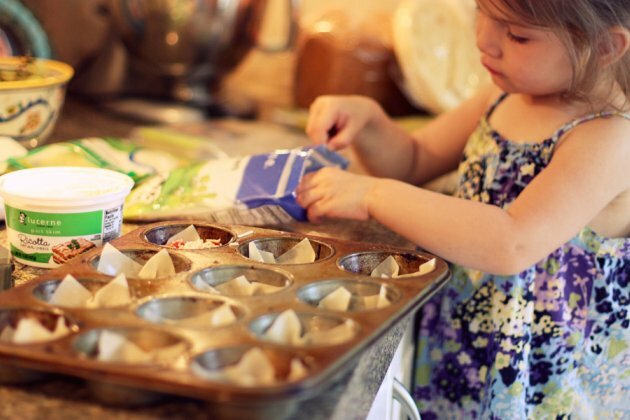 Place a wonton wrapper in each muffin cup. Sprinkle with 2 teaspoons parmesan cheese, 2 teaspoons mozzarella cheese, 2 teaspoons ricotta, then top with 2 teaspoons sauce. Repeat with one more layer than top with a final sprinkle of mozzarella cheese. Bake for about 17 minutes or until wonton wrappers are crispy. Let cool for 5-7 minutes, carefully remove from muffin tin and enjoy! These look amazingly delicious! I love the M is cooking with you! Jay made his egg and cheese bagel sandwich all by himself today. I was so proud of him. It is so weird that he is old enough now to actually cook for himself. I’m starting to get sad at how fast the time is going. Enjoy your time in the kitchen with your girls! oh my gosh!! LOVE!!! 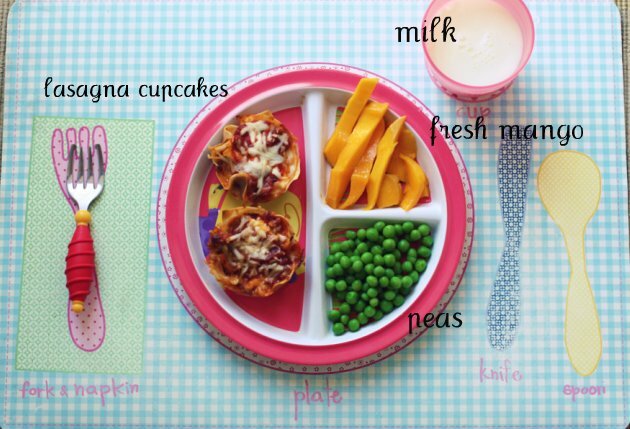 and i LOVE that place mat…my daughter would LOVE it!! i think i may have asked you this already – is it from pottery barn kids? What a wonderful child-friendly meal. I’d be happy with this myself!